A celebration service honoring Betty will be held on Saturday, February 16, 2019 at 11:00 a.m. at St. Mary Lutheran Church, 2001 80th Street, Kenosha, WI, 53143. A visitation will take place Saturday, February 16th at the church from 10:00 a.m. until the time of the service. Memorials may be made in her memory to the Alzheimer’s Association, 620 S 76th Street, Suite 160, Milwaukee, WI 53214-1599 or Hospice Alliance, Inc., 10220 Prairie Ridge Boulevard, Pleasant Prairie, WI, 53158. 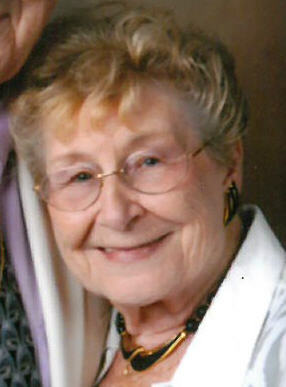 Betty J. Bruno, age 94, of Kenosha, died on Friday, February 8, 2019 at Hospice Alliance, Inc/ Hospice House. Born in Phoenix, AZ on March 20, 1924, she was the daughter of the late Adolph and Bertha (Kroll) Haubrich. The family moved to Kenosha when Betty was just 3 years old. She attended local schools and graduated from Kenosha High School. In 1945, Betty married Eugene Archer, father of her children and later divorced. She married Peter Bruno on January 25, 1971 in Kenosha; sadly, he passed away on June 10, 1984. She was a loving homemaker for her husband and two daughters and also waitressed at The Master’s Restaurant for many years. She enjoyed knitting, was an avid reader and “people watcher”. Left to cherish her memory are her daughters, Lynn (David) Funk and Sandra Alm, seven grandchildren; ten great grandchildren and her dear companion, Elmer Schmidt. Along with her parents, and husband, Peter, she was preceded in death by her siblings, Margaret Myers and Robert Haubrich.